Robert Mugabe has finally gone. A tyrannical rule of 37 years has come to an end, with some apparent deal having been done to permit him to leave by the back door and live out a happy retirement in South Africa or Singapore or Dubai – or somewhere else with great Gucci shopping and a convenient 10-bedroomed mansion he could buy with his billion-dollar fortune. As thousands dance and rejoice on the streets of Zimbabwe, you might understand why they’d just want to turn the page on this dark chapter and look to a better future with Emmerson ‘Crocodile’ Mnangagwa. Surely anyone is better than Robert Mugabe? Even the Crocodile? Surely this is certain a case of better the devil you don’t know? Under the Mugabe devil, life expectancy in Zimbabwe fell from 62 to 36. He destroyed the nation’s healthcare and economy, decimated food production, and shut off water supplies. He is considered to be responsible for around 50,000 deaths, not only from cholera and other diseases, but people have been made destitute ejected from their homes, abducted, tortured, sexually abused and systematically massacred. Why should a psychopathic murderer be permitted to flee? Doesn’t he need to face justice? The pictures reproduced at the bottom of this post might move you to disbelief or tears of rage. This is a warning again to read no further if you are of a sensitive disposition, but sometimes pictures speak far louder than a few column inches or a bland comment by the British Foreign Secretary. There was a story recounted by Peter Oborne in the Daily Mail a decade ago. It is reproduced below, lest it might disappear and we should forget. It is a tale of suffering and depravity, and yet also one of hope, for the victim’s spirit was not extinguished by her experience of Mugabe’s hell. We knew it was happening, but our ‘ethical foreign policy’ turned a blind eye. The Southern African Development Community knew, and they made a few speeches. The EU also knew, and froze a few assets. The UN also knew, and issued a few directives. 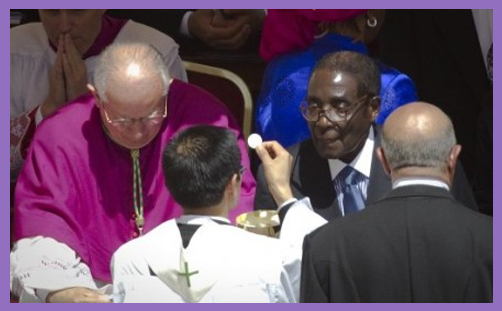 The Vatican also knew, but the devil Mugabe was never excommunicated. They (/we) have been complicit in the propagation of evil. You are again STRONGLY WARNED that the pictures at the bottom of this post are shocking. They were considered too graphic for the Daily Mail to publish. Robert Mugabe’s paid assassins came hunting for 22-year-old Memory, a married mother-of-two. They burst into her home, seized her and her children, and took them to their temporary headquarters in the local village school. Four men held down her arms and legs, while a fifth gripped her head, placing his hands over her mouth to prevent her screams being heard. Two others, wielding heavy wooden poles, then took turns to thrash her on the buttocks in a beating that lasted half an hour. 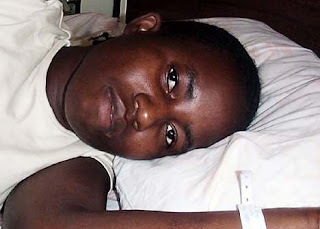 I saw Memory in her hospital bed after she had been brought in from the bush more dead than alive a week ago last Monday, several days after her beating. She was lying on her front: it was obvious why. Where her buttocks should have been was just a mess of raw flesh. I watched as a blue-suited nurse removed one of the bandages. Memory whimpered and moaned with pain. With me was a hardened welfare worker who had witnessed many terrible things. She broke down in sobs. I must tell you that tears poured down my cheeks, too. Memory was in far too much pain and shock to answer any questions. I pressed her hand gently and left her. The following day, I returned to the hospital and saw Memory’s beautiful face and, since her pain was beginning to subside, heard her sweet, low voice for the first time. She told me how on arrival at the school (which she had attended as a child), she had been ordered to sit in the playground with a group of supporters of Zimbabwe’s Movement for Democratic Change (MDC) – the opposition party led by Morgan Tsvangirai. On the dot of 8am, the beatings started. Groups of eight people at a time were ordered out for treatment at the hands of a band of around 200 members of Robert Mugabe’s militia, each wearing Zanu-PF T-shirts and green, red and yellow bandanas signifying the national flag. Many of them were high on drink or drugs. She watched as four of her close friends were beaten and kicked to death. A fifth friend later died, and others remain unaccounted for. The militiamen chanted songs and spat insults at Morgan Tsvangirai as they did their work. They told Memory, whose farmer husband was away: “You and your husband are MDC members so we must beat you.’ They said that she belonged ‘to a party of animals”. Memory told me how she could hear her children screaming “Mamma, Mamma, Mamma!” during her beating. They were held back by female members of Zanu-PF. Later, Memory was ordered to sit for two hours on her wounds. Mugabe’s thugs told her she would be thrashed again if she moved a muscle. Believe it or not, just by being alive, Memory is one of the lucky ones. She is just one of tens of thousands of victims of the campaign of violence launched by Robert Mugabe after he comprehensively lost the presidential elections on March 29. Opposition leader Morgan Tsvangirai has agreed to contest a new runoff against Mugabe, even though he knows he won outright in the first round and accuses Zanu-PF of blatant vote-rigging. A stand-off over the MDC’s demand for international observers and media to be given full access to ensure the vote is free and fair has brought matters to a standstill. The decision last night to delay the poll until the end of July raised the terrifying spec-tre of Mugabe’s Green Bomber youth militia carrying on their reign of terror for ten more weeks. An MDC spokesman said last night the law change was “illegal and unfair”. Shamefully, as a result of the standoff, the world’s attention has shifted away. It’s the worst seen since he ordered genocide in the west of Zimbabwe 25 years ago, when some 20,000 people were killed in an attempt to eradicate all political opposition. The world turned a blind eye then. Tragically, it is doing so again now. And make no mistake: there is nothing spontaneous about these attacks. They have all been carefully and deliberately planned by Mugabe, his loathsome deputy Emerson Mnangagwa and the 15 or so senior military police and intelligence officers in the Joint Operation Command (JOC) which now runs Zimbabwe. Their intention is to intimidate the supporters of the opposition so that they either cannot, or are too afraid, to vote in the run-off elections. Mugabe has made it plain that he will never hand over power after 30 years as ruler – even if he loses the vote again. According to senior security sources, government officials have been told that he intends to win the election by use of intimidation, backed up by ballot-rigging on a massive scale. And if that does not work, the result will simply not be published. Shockingly, the strategy of murder and retribution has the support of Mugabe’s close friend, the despicable President Thabo Mbeki in neighbouring South Africa. Through illegal methods, including the torture and blackmail of abducted opposition activists, Zanu-PF has obtained a list of all the polling agents and leading activists who work on behalf of Morgan Tsvangirai and the MDC. Now, village by village, town by town, it is embarking on a savage campaign to eradicate them all. The attacks happen at night or in the early morning. Typically, MDC supporters such as Memory are seized and subjected to terrible tortures. For example, boiling plastic is poured on their backs, their extremities are burnt, or they are nearly drowned in water tubs. The aim is to force victims to betray the identities of those on their own side – thus providing human fodder for more attacks. “We can trust nobody now, not even our friends,” an MDC activist called John told me. Today, everyone in this tragic country lives in a state of permanent fear and suspicion. They believe that their phone lines are tapped, and that they are being watched by police informers and betrayed by their own friends. Above all, they live in terror of the early morning knock on the door. Mugabe’s thugs are nothing if not imaginative in their methods. One MDC organiser, Moses Bashitiyawo, was beaten by Zanu-PF activists and then forced to climb a tree with a rope round his neck before being told to jump to the ground, hanging himself. Others are driven down mineshafts – as happened in the genocide of the 1980s. I experienced a small element in this campaign of terror in the rural areas when, shortly after my arrival in Zimbabwe, I hired a guide to take me to his home village some 50 miles from Victoria Falls. The village head man told me there had been two Zanu-PF meetings there during the past 24 hours in which suspected MDC supporters had been driven away. He also revealed that those who survive Mugabe’s murderous purges are then subjected to food deprivation. The village elder produced a ration card entitling each Zimbabwe family to 10kg of Mealie Meal (a kind of maize that is the national staple diet in a country plagued by food shortages) from a local relief organisation every month. The months of February and March had been ticked off, showing that the food had been handed over. But there were no ticks for April and May, revealing how hand-outs were stopped as a way of punishing Mugabe’s political opponents. The elder told me his children were away in the forest looking for wild fruits. “We are so hungry,” he said. The worst atrocities are concentrated in Mugabe’s Mashona heartlands in the east of the country, where he is wreaking horrific revenge on the voters who opposed him during the March presidential election. Here, the stories of burnt villages, casual massacres and roving statesponsored militia bands are all too reminiscent of the ethnic cleansing in Darfur, Western Sudan. Grotesque language such as this is widespread. The violence, originally confined to rural areas, has been spreading into towns. Details are beginning to emerge of a police operation to close down Anglican churches in Harare, Zimbabwe’s capital. On Sunday, churchgoers were met by riot police barring the doors. At Christchurch, in Harare’s northern suburb of Borrowdale, parishioners found the church doors locked and groups of police waiting outside. Laymen who attempted to protest were beaten up, while the brave churchwarden was arrested. Riot police also arrived at St Francis Church in the Waterfalls district, where Communion had already started. Police charged to the altar and seized women worshippers, pulling them from the Communion rail and beating them senseless. The reason? Mugabe’s henchmen accuse the Anglican church of being in league with the MDC opposition. It is all part of a cynical attempt to break the spirit of the Zimbabwean people. In some cases, inevitably, the campaign of terror is working. And I am ashamed to say the world’s seeming indifference since its attention turned away from Zimbabwe is leaving Mugabe emboldened. In one hospital, I spoke at length to a 35-year-old farmer called Felix. He described how he and his wife had spent a week on the run from Zanu-PF thugs after they invaded his village. They managed to walk 70 kilometres to Harare, where they found refuge. Friends have since told him that his home has been burnt down and his 15 cattle slaughtered. Worst of all, his mother and his children have disappeared. 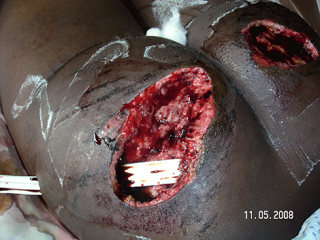 Despairingly, he says: “It would have been much better if they had killed me. Now, in a state of collapse, he is consumed with bitter regrets about joining the MDC. A party activist, who was accompanying me, tried to comfort the farmer, telling him: “You did the right thing. There are a lot of brave people like you, and we’re going to succeed. Again and again, during my visit to this country, I met ordinary Zimbabweans who shared this optimism, despite all the horror they are suffering. As I stood up to leave the bedside of Memory, I asked if, despite all she had been through, she would still vote for Morgan Tsvangirai in the presidential run-off. Her face lit up with a wonderful, radiant, artless smile. “Oh, yes!” she said. While this amazing spirit of courage and optimism remains, there is still hope this wonderful country could soon rid itself of its appalling despot Robert Mugabe – if only the world would stop averting its eyes and finally take the moral responsibility to help end this tragedy. What is the purpose of an International Criminal Court if murderous monsters like Robert Mugabe can inflict this sort of barbarism on a fellow human being and get off scot-free? Where is the retribution? Where is the justice? Where is the repentance? Where is the excommunication? Safeguarding: why is the Church of England’s institutional compassion so constipated?